FACT CHECK: Does Walmart Sell Insulin for $25 a Vial Without a Prescription? Does Walmart Sell Insulin for $25 a Vial Without a Prescription? The question centers on a different type of insulin than most diabetics are currently prescribed. Insulin can be purchased at Walmart for $25 a vial. Novo Nordisk-manufactured human insulin can be purchased at Walmart stores without a prescription for $24.88 a vial (except in Indiana). The most commonly prescribed form of insulin is insulin analogs, which require a prescription and are currently the subject of a controversy over soaring prices. Readers asked us whether this was true. It is true, although you should note Walmart sells human insulin, an older version of the glucose-moderating hormone, whereas most insulin-dependent diabetics are currently prescribed insulin analogs that have evolved to help prevent dangerous swings in blood-glucose levels. We confirmed with Walmart that the retail chain does indeed sell human insulin without a prescription (except in Indiana). That product is Novo Nordisk-manufactured Novolin, which Walmart has branded as ReliOn and sells for $24.88 per vial. Walmart spokeswoman Marilee McInnis confirmed to us that the company has “maintained, through negotiation, the same retail to patients since 2011.” To say that the insulin is sold “over-the-counter” isn’t quite accurate, however, as customers must ask a pharmacist for it. Although this revelation might be important, life-saving information for diabetics, an important caveat is that human insulin behaves differently than the newer analog insulin currently retailing for more than $300 a vial. Deliver a dose of NPH [human] insulin, and it’ll reach its peak about six to eight hours later. This means your insulin may peak while you’re sleeping, posing a serious danger if you don’t wake up to treat. Long-acting analogs, on the other hand, don’t peak, resulting in more-stable blood glucose levels and fewer unexpected highs or lows. 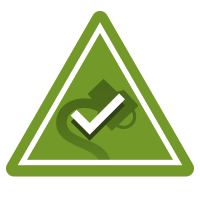 In fact, one study showed that long-acting analog insulin glargine reduced overnight bouts of hypoglycemia by up to 48 percent compared with NPH. In another study, detemir reduced nighttime hypoglycemia by 34 percent. This is especially beneficial for people with type 1, who need to be much more precise about matching insulin dosages with their insulin needs to avoid nighttime lows, says Sisson. Note, there are two types of diabetes. Type 1 diabetics’ bodies cannot manufacture insulin, the hormone responsible for glucose absorption. Type 2 diabetics’ bodies, on the other hand, become resistant to insulin. In most cases, Type 1 diabetes starts in childhood, whereas Type 2 is sometimes referred to as “adult-onset” diabetes. 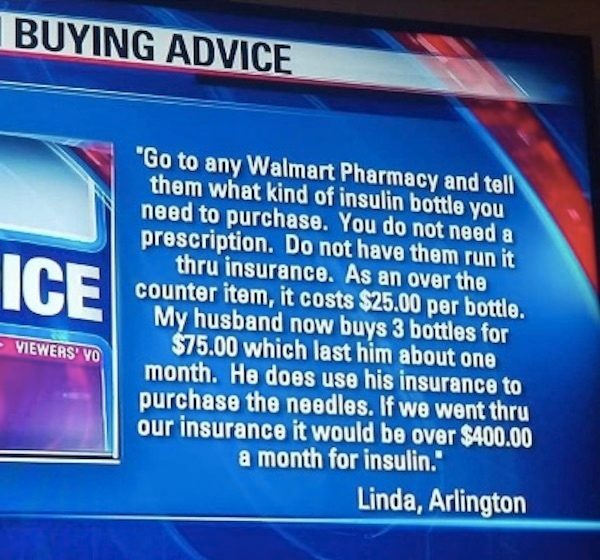 The screen shot from the KDFW report no doubt went viral as a result of an ongoing controversy over the cost of analog insulin, which as of 7 February 2019 soared to a retail price of more than $300 per vial. Americans have been awash in medical horror stories such the death of Jesse Lutgen, a 32-year-old Type 1 diabetic who lost his job at a distribution center in Dubuque, Iowa, and with it, his health insurance. He was found dead in his home in February 2018, having run out of insulin. His last vials of the medication were given to him by a friend. Novo Nordisk. 29 November 2018. The Washington Post. 31 October 2016. Insulin Nation. 16 September 2016.